It’s Winter and all the signs of it are well and truly here! I am very particular with my skincare and having tried many moisturisers, I only use one particular day moisturiser. So when I tried Moa, The Green Balm, I wasn’t sure whether I would get on with it. However, from the first moment of trying it, I fell in love with it. Yes, in total and utter love. I rubbed a tiny amount between my fingers and applied to my skin. I have slightly dry skin, so this was a welcome to my thirsty skin. I tried this on a day when I didn’t need to go out, and my skin felt amazing soft and nourished for the whole day. I even got comments about how good my skin was looking – without make-up. It also left a lovely sheen finish to my skin. I have been using this for a few weeks now and I really cannot praise it enough. I look forward to coming home at the end of a long day, taking my make up off and nourishing my skin with Moa. For days I wear heavy eye make-up, this will even turn into an oil to take off the most stubborn of eye make-up. I also tend to keep a tiny amount in a pot and use it on my lips to avoid chapped lips. One thing I would say is to not use it before applying make-up, as I found my foundation just sat on it and my make-up came off easily throughout the day. Although when I did apply make-up on top of Moa, at the end of the day, it didn’t even look like I was wearing make-up. But my skin still looked great. A bonus anyway! I don’t usually leave the house without make up, but for days I don’t have much on, I will just use Moa and go out. I love the sheen it leaves and the feelng that you’re really looking after your skin. The Moa is 100% natural and contains organic herbs. It’s free from all the bad stuff like chemicals, preservatives, alcohols etc. My sister has sensitive skin and is very particular about what she uses on her skin. She tried Moa after seeing it on my skin and when knowing it was 100% natural, she tried it. I have to keep her away from my pot, as she has fallen in love with it. The beauty of this product is that you only need a small amount to see it work. For those of you who follow me on Twitter know how prone I am to a sore throat, well believe it or not, this helps it. Gargling with spoonful of this in hot water should see you right. It’s like a total miracle in a pot! I sure will order more of this when I run out. 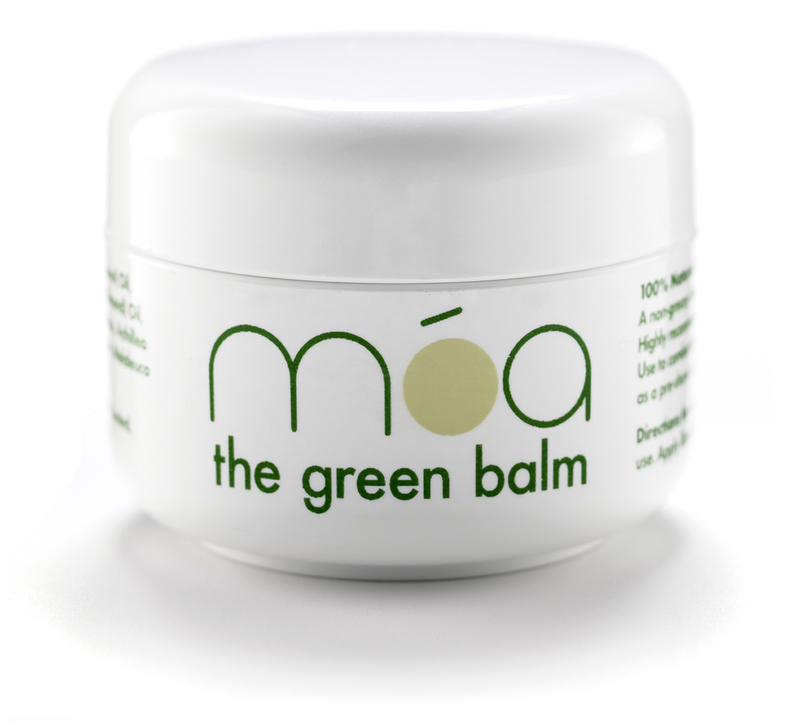 Moa, the Green Balm is priced £9.99 and available from www.thegreenbalm.com as well as all good health food stores. I have now had three microdermabrasion treatments and each time I mention it on Twitter, I get a huge response asking me about it. For those of you who do not know what Microdermabrasion is, it is a powerful exfoliating treatment. It is a non-invasive cosmetic procedure that uses micro-crystals to abrade and rub off the top layer of dead and dull skin cells. It reveals the newer, younger and smoother skin underneath. Without boasting, I generally have good skin. I don’t get many break outs, apart from when I am overly stress and it will show on my skin. I wanted a course of Microdermabrasion just to give my skin a bit of a boost and make it smoother. So I had my first treatment about three months ago. Many people ask if it hurt. It didn’t hurt, but it felt very strange and at times a little uncomfortable. Well, it would do as you’re having the top layer of your skin removed with diamonds. However, I soon got used to the sensation. Whilst undertaking the treatment, you really do need to look after your skin and wear at least an SPF 15 (which I usually do within my daily moisturiser). I also finish my treatment with vitamin E boost mask, which just leaves my skins looking and feeling great instantly after the treatment. It just means going out without make up isn’t so bad. About two weeks after my first treatment, I was ill and admitted into hospital with a kidney infection. By day three, I felt horrible with being too ill to implement my usual skincare regime. However, my mother commented how well I looked despite being in hospital and that the microdermabrasion’s results were already showing. I know she’s my mother, but she really does say it how it is. I have found it is easier for others to notice, before you actually do. I have now had three treatments and I can already see the results. I know if I had any specific problems with my skin, or even bad skin, then it would work wonders for it. But because I already have clear skin, I have to look closer and find it harder to see the difference myself. I know the thought of microdermabrasion scares some people away, but I would recommend real researching the treatment, going to a salon and speaking to them about it. I can only give my experience of it, but they will explain in much more detail and answer your specific questions. 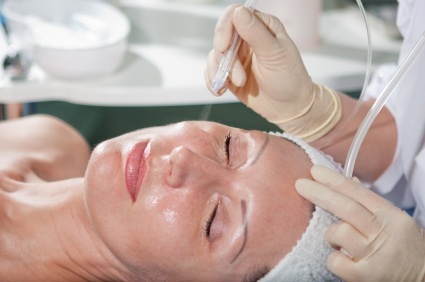 I am always interested in hearing about other people’s experiences of microdermabrasion. If you’ve had it, how was it for you? Also, do let me know if you do go for the first time. Each week on a Sunday I will log what I have bought at the end of that week. Fear not, I will not log my food or any of the everyday things. It will mainly be fashion and beauty related, with the odd pieces here and there. I did buy a few items when purchasing these trousers but I have returned the others, so they don’t count. 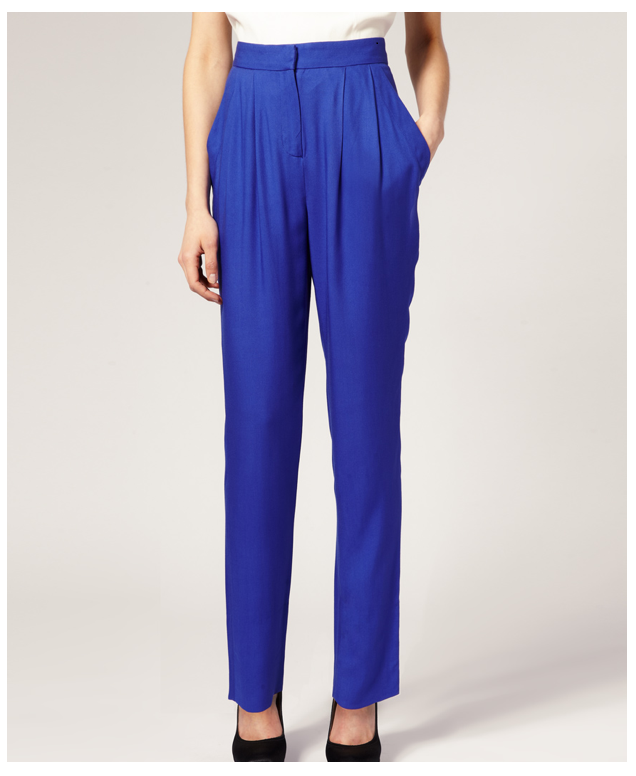 These trousers fit so well and I absolutely love the blueness of them. It goes very well with white, beige/cream and as well as other bright items in my wardrobe. I cannot wait to wear them. My sister loves Topshop, I rarely shop in it, mainly because it is always so busy. So on Friday after work, I decided to have a look. I quickly got bored at looking at the clothes, so decided to do that later online. I went to the jewellery and accessories section and saw this make up bag. 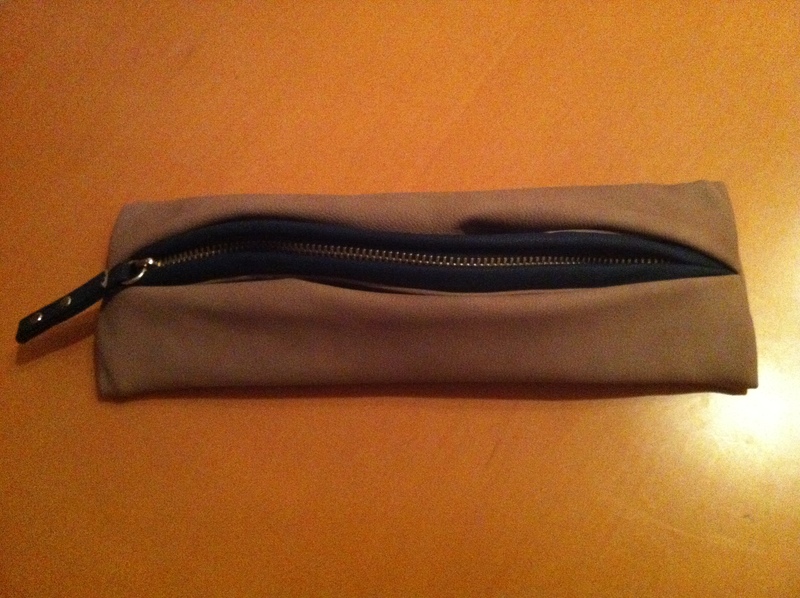 I have been thinking of updating my make-up bag and this is the perfect size. I also love the inside of the bag too. I mainly only wear Chanel nail varnishes, mainly because they are so lovely when applying – so idiot proof. I also like the bottles. I decided to try on some of Topshop’s nail varnishes as I remember my sister saying how much she liked them. I decided upon a colour and bought it. I have applied it to my sister’s nails but haven’t had time to wear them, so I won’t comment on it just yet! Overall, I think I have done well with my spending! Feel free to giving me a telling off if you see too many clothes in this section!